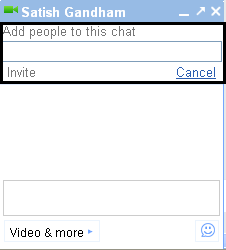 The Chat feature Inside Orkut not only enables you to chat with any number of your online friends at the same time but it also lets you chat with many friends at once with the help of the “Group Chat” sub-feature. With the Group chat feature inside Orkut, you can invite and have a group chat with any number of friend online and any participant can invite others to join. 1. Start a chat with any one of your Online Friends. 3. After selecting ‘Group chat’ feature, you will see a field at the top of the chat window labeled ‘Add people to this chat’ where you can enter the name or email address of the contact(s) (comma separated) you want to add to your group chat and then click Invite. 4. Once your invited friends accept your Group chat request, they will be added to your Group chat. At any point of time if you want to end your chat session, just click close(X) button at the corner of your chat window and other members participating in the group chat will get a message saying that you’ve left the conversation. And If you want to rejoin that same group chat, you’ll need to be invited back by a contact who’s still in that Group chat. The group chat will continue to exist until all participants have left the conversation.